API now available for our freight system to be embedded directly into your online sales platform! Your clients can now literally quote, book, and schedule their products to be shipped via freight while checking out just like Fedex or UPS parcel systems! Just input the address and shipping preferences and then the shipment gets auto booked. Awesome! 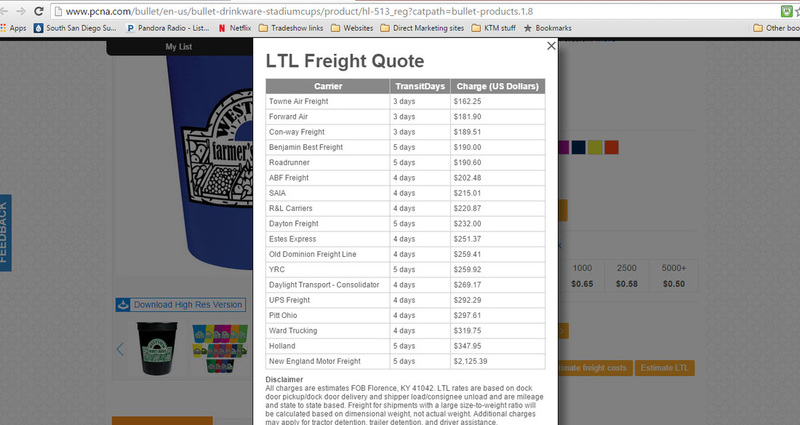 Screenshot of quote including carrier, transit days, and price for completing purchase! Game Changer! Frontline Distribution now has an API so its clients and prospective clients can integrate their industry leading Freight Management System, Carrier Rate, right into their sales websites. Although our Freight quoting, booking, and tracking system is one of the industries leaders, clients still had to log into their accounts and run the quotes to close certain sales that were price sensitive. Gone are those days now, as we are now have an API or Application Program Interface that lets you essentially embed your freight account and rate structure right into your wholesale and ecommerce sales website. Just imagine, from here forward your clients can essentially be completely self-serviced when buying from your firm if you like. They will be able to log into your site, choose the merchandise they want to purchase, quote the freight shipping, choose the carrier and price they like, and complete the purchase with shipping included. Once they completed the purchase freight carrier will also be scheduled like normal with your account through us. The only question now is what are and you and your logistics team going to do with all your free time now that you don’t have to quote freight to win and finalize every sale! Below are screen shots of actual client’s website with their freight management accounts embedded into their sales platform. Call us and then call your programmer, because you are going to want to take advantage of this new API for Frontline Distribution’s logistics clients.